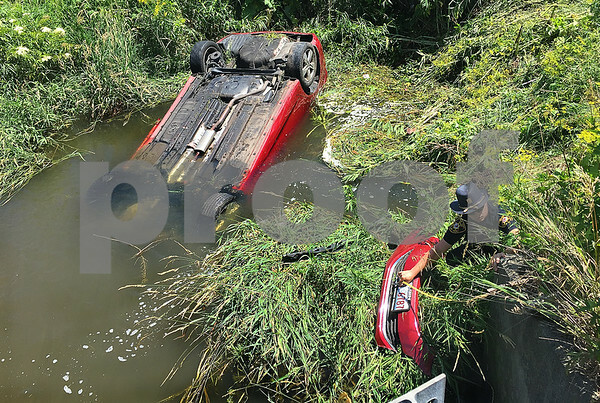 A DeKalb County Sheriff's Deputy measures the distance of the partially submerged car's bumper from First Street above in Sycamore during the investigation after a single car rollover accident on Wednesday, July 6, 2016. A small child was transported to Kishwaukee Hospital after Sycamore and DeKalb firefighters and DeKalb County Sheriff's Deputies pulled her from her car seat. The driver was able to exit the vehicle and was also transported to Kishwaukee Hospital.